Despite the exceptionally high quality compositions, the unanimous decision of the Jury awarded the first prize to Kristóf Siklósi’s (20, Bartók Conservatory) string quintet, Five Moving Landscapes. The piece was performed by Boglárka György, Ottília Revóczky, Eszter Kalocsai, János Madaras and Kristóf Hosszú. 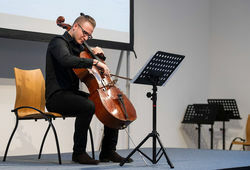 Viktor Molnár (23, Liszt Ferenc Academy of Music) won the second prize for his composition entitled, No name performed by Bálint Südi, F-horn, and Ottilía Revóckzy, violin. The shared third prize went to Marcell Bencsik (25,Liszt Ferenc Academy of Music and Corvinus University) whose piece entitled, Damn it was performed by Mózes Nagy, B-clarinet; and to Nicola Namoradze (24, Liszt Ferenc Academy of Music, Julliard, City University of New York) for his piece Eau for cello and electronics performed by János Madaras. The Fidelio Média Kft increased the prestige of the competition by offering participation in the Fortissimo mentor program for one composer. Upon the suggestion of Mr. Géza Madaras, the organizer of the competition the jury selected the composer for the Fortissimo mentor program whose composition related to the theme of the exhibition in both the most imaginative and complex manner. The most perfect fit was Eau by Nicolas Namoradze. The musicians – themselves students of the Liszt Ferenc University of Music, too – rehearsed in the presence of the composers, in this way giving an impeccable performance despite the extremely short practice time.Each of the four medalists related to the inspirational source materials in their own way. In some the relationship was felt directly, in others only as associative effects. What united the four pieces was their exceptional power to create unique atmosphere. The competition was a success for more than one reason. It was supported by two independent cultural institutes (the Vera and Donald Blinken Open Society archives and the Intermezzo Art Fund) and provided opportunity for young composers and instrumental musicians outside the state support system and the musical institutional framework. The young artists were given an opportunity to try themselves out individually as well as in a team, both ways indispensable for a successful musical career, and, added to this they could formulate their reflection on a social problem through their own, particular and sensitive way.